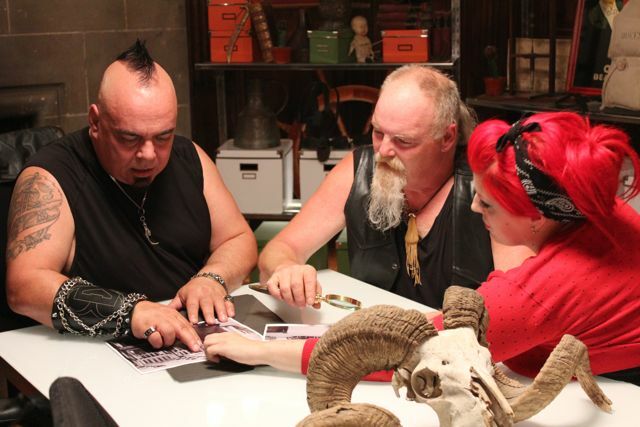 Deals from the Dark Side, follows eccentric collector Steve Santini on his quest to buy and authenticate dark relics. Santini scours North America looking for the rare, unusual, and tragic; A Titanic Deck Chair, Jack the Ripper’s Knife, A monk’s cloak from the Spanish Inquisition. Objects that carry an undeniable force connected to iconic events and infamous people long since passed. Santini’s burning quest to understand the dark side of humanity and his unique obsession with pain and death is also the reason why Ripley’s Believe It or Not has dubbed him the World’s Most Extreme Escape Artist. Hundreds of death defying escapes has given him insight into the darker side of the human condition. Helped by his trusted side kick Biker Rob and his brilliant researcher Stef, they enter a world few of us dare to investigate.